EOS, Trans. American Geophys. Union, v. 81, no. 48, Nov. 28, 2000. Readings 3976-15 and 378-16 may be paraphrased to say that around the end of the 1958-1998 period of gradually increasing Earth changes, and then between 1998 and 2001, we may expect upheavals in the Arctic and Antarctic just prior toa shifting of the poles. We have already documented “the first direct evidence of recent volcanic activity in the high Arctic,” (Müller and Jokat, EOS, 6/13/00) in 1998 and 1999. (See our previous article, “Precursors Of The Pole Shift And Earth Changes Of 2000 -- 2001”). A Regional Focal Point For “Breaking Up” of the Western U.S.
Reading 3976-15 states that “As to the changes physical again: The Earth will be broken up in the western portion of America”. Two geologists with the U. S. Geological Survey offer an abstract entitled, “Large-Scale Geologic Patterns Point To The Birth Of A Hotspot In The Western U. S.” Such a hotspot could well act as a regional focus for the breakup of the Oregon-Idaho portion of the American West, at the beginning of pole shift, if magma from the hot mantle below begins to rise more quickly there. 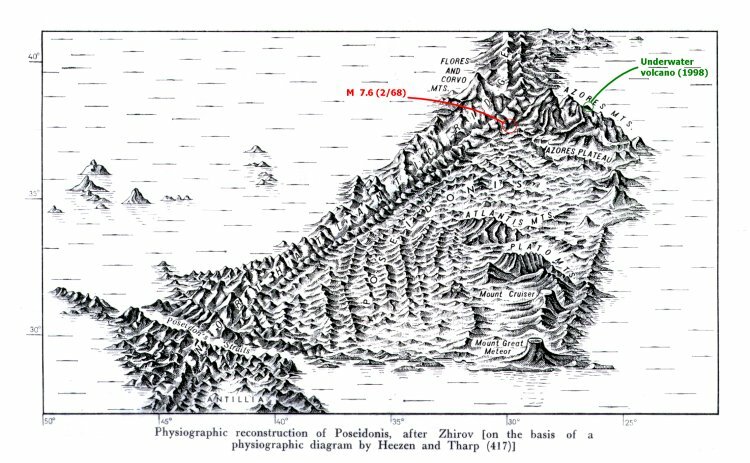 J. Glen and P. Ponce write, “ Numerous geologic lineations (including fold axes, dike swarms, and faults) when extrapolated, intersect at approximately the same location, suggesting that all these features radiate from a single point - a region near the Idaho-Oregon border at about latitude 44 degrees [emphasis added].” A possible cause for this pattern is a point stress at the base of the lithosphere that could be related to the impact of the Yellowstone hotspot.” (Note: The Yellowstone hotspot is conceptualized as a stationary plume of hot mantle material that is rooted in the lower mantle over which North America moves.) [T21C-15]. And Poseidia will be among the first portions of Atlantis to rise again. Expect it in sixty-eight and sixty-nine; not so far away. And then we also note the following reading that implies that Atlantis would gradually begin to rise in 1998. A In 1998 we may find a great deal of the activities as have been wrought by the gradual changes that are coming about This is a gradual, not a cataclysmic activity in the experience of the Earth in this period. This is a far different story from that given in the Cayce readings on Atlantis, unless one is willing to accept the readings' assertion that the Azores portion of the central Atlantic ocean basin was above water after formation of the Azores plateau, and then sank in successive stages beginning around 19,400 years ago. Here, then, the five authors of the abstract have come to the conclusion that a crustal segment of the Mid Atlantic seafloor was uplifted rapidly due to a pole shift 12 million years ago. One asks, if such uplift could happen then, could not at least some parts of Poseidia rise again, relatively undeformed, during the pole shift predicted in the readings for 2001? Were The Dark Ages Triggered by Volcano-Related Climate Changes in the 6th Century? K. Wohletz, a volcanologist at Los Alamos National Laboratory, contributed to David Keys's research on the origin of the great climatic cooling of the sixth century A.D. More on David Keys in the complete version of Wohletz's abstract given below. Just below is my write-up of the Public Broadcasting Systems' show on the same topic. The importance of the 6th century eruption and its effects on humanity relates most directly to the statement by Archangel Halaliel about “the darkening of the Sun” and the breaking up “of the Earth in diverse places.” (3976-15, 1/19/34) This is to occur, presumably, at the beginning of the predicted pole shift in 2001. Hutton's commentary on “ CATASTROPHE! A two-hour PBS program of this title reports on the origin, nature, and worldwide impacts of the climatic cooling of the mid sixth century. This is believed to have been due to the massive eruption of an Indonesian volcano. The inferred eruption of Krakatau in 535 was hundreds of times greater than any we know of, especially since the 20th century was one of the quietest on record for volcanic eruptions. The 535-555 interval began with significant solar darkening, a worldwide temperature decline and then led to floods and droughts, crop failures, and famines. (Perhaps this is why Cayce readings 3620-1 and 257-254 say that "anyone who can should buy a farm, and buy it if you don't want to grow hungry in some days to come," for "the hardships for [America] have not yet begun, so far as the supply and demand for foods are concerned"). Only equatorial volcanic eruptions can spread atmospheric dust in both hemispheres. Thus, the big Indonesian volcanoes like Krakatau are suspect for the 535 eruption. Today, we should watch the likes of Semeru (Java) or Kaba (Sumatra). Recall too that when Indonesia's Tambora erupted in 1815, it produced enough climate cooling to cause many New Englanders to move to the Ohio River Valley because they could grow no crops for two years and were concerned about the future. Most serious, however, was Mt. Toba's eruption, on Sumatra 71,000 years ago. That eruption blew 800 cubic kilometers of ash into the air -- 4,000 times as much as Mt. St. Helens -- the largest eruption in 400 million years. Toba buried most of India under ash. This was a true cataclysm, as opposed to a less intense catastrophe, because it had significant worldwide effects. An estimated 75 percent of the Northern Hemisphere's plants may have died. At the end of the first six years of climate cooling, a thousand-year ice age began. Perhaps only a few thousand people, living in isolated pockets in Africa, Europe, and Asia survived. Thus, it's just possible that the readings'-predicted "darkening of the sun" may be severe enough that there will be little or no food to import from other countries, and it may take hundreds of years for a new social reality to emerge. While it sounds foolish to even think in such terms, Earth scientists are familiar with assessing such possibilities. And, as one Hopi elder has said, "When the changes begin, there will be a big noise heard all over the Earth." Note that the 535 eruption was heard as a low rumble thousands of miles away. If we hear such a rumble, should we drive as quickly as possible to grocery and drug stores to load up on necessities? Well, as the saying goes, "Trust in God, but tie your camel first."